The Call Of Duty: Modern Warfare 3 Content Collection 1 Hits Xbox LIVE on March 20. "Activision Publishing, Inc. revealed today that the Call of Duty: Modern Warfare 3 Content Collection 1 will release on Xbox LIVE on March 20, the first of four Content Collections available for purchase to all Call of Duty: MW3 gamers. MW3 Collection 1 includes an unprecedented breadth and variety of content for Call of Duty downloadable release – four brand new multiplayer maps Liberation, Piazza, Overwatch and Black Box along with new Special Ops Missions Black Ice and Negotiator, marking the first time Special Ops has been made downloadable online in franchise history." In “Black Box,” players will battle beside a downed Air Force One amidst multi-level homes overlooking the luxurious Southern California neighborhood. Infiltrating a diamond mine aboard a snowmobile in the Special Ops mission “Black Ice,” your primary objective is to plant high-grade explosives in order to shut the mine down forever. In “Negotiator,” you head to India for high-stakes hostage extraction in which you’ll breach-and-clear rooms and navigate surface streets to ensure the safety of your VIPs. Additionally for Call of Duty Elite Premium Members on Xbox LIVE, Call of Duty Elite Content Drops 4-6, featuring Black Box, Negotiator and Black Ice, will be available for download on March 13. Elite Content Drops 4-6 and MW3 Collection #1 will be made available on other platforms at a later date. 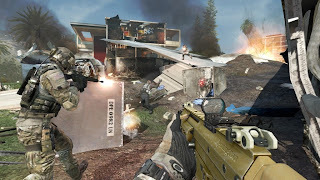 The Modern Warfare 3 Content Season is published by Activision and co-developed by Infinity Ward, Sledgehammer Games and Raven Software. Coming first to Call of Duty Elite Premium Members on Xbox LIVE, all content will be available to Premium Members on other available platforms at a later date. The full calendar of content is outlined here – http://www.callofduty.com/contentcalendar. Call of Duty: Modern Warfare 3 is rated “M” (Mature) by the ESRB for Blood and Gore, Intense Violence and Strong Language. For more information on the Call of Duty: Modern Warfare 3 content drops, season of content, Call of Duty: Modern Warfare 3 and Call of Duty Elite visit www.callofduty.com/mw3 and www.callofduty.com/elite.